Please call your email: "newfoundland vacation" so that we can pick you out from the spam. Thanks. The Newfoundland South Coast Wilderness is home to one of the largest populations of Bald Eagles in North America and a number of nesting pairs are observable on our Coastal Safari. Birders will see a wide variety of seabirds around our wilderness camp. Murres are amongst the 35 to 40 million seabirds that visit the plankton rich waters of Newfoundlandland every year. During the winter months the ice free waters of the Newfoundland South Coast Wilderness provide overwintering habitat for millions of arctic birds. In spring these populations migrate north to their breeding sites and are replaced by millions of birds that have overwintered offshore on the Grand Banks of Newfoundland. They are soon joined by migrants from southern latitudes and in the case of the Arctic Terns from the southern hemisphere. By May these millions of birds are busily engaged in breeding and nesting in hundreds of sites along the coast. One of the most eminent bird scientists in Newfoundland and Labrador is Dr. Bill Montevecchi of Memorial University of Newfoundland and Labrador. As well as conducting world class research on the interaction of birds with the marine environment, Bill has been an outspoken advocate for birds and sane management of our marine resources. Click here to see some of his public writings and speeches. Just about every small island and cliff face has a colony of nesting birds. The most important have been given ecological reserve status. The Witless Bay Ecological Reserve near St. John's comprises three islands: Great, Gull and Green. 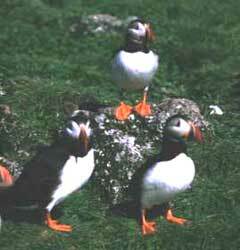 This reserve contains the largest Atlantic Puffin (Fratercula arctica) colony in North America. 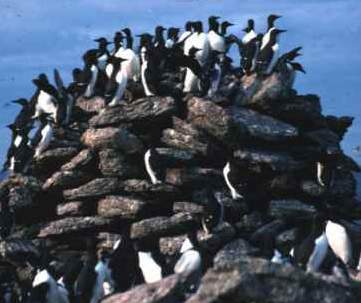 Green Island contains North America's second largest colony of common murres. Natural History Society of Newfoundland and Labrador .